1. Hot chocolate. Keep it simple and pick up pre-packaged hot chocolate (just add water!) and marshmallows. If you’re feeling ambitious, you can cut the marshmallows into hearts. 2. Heart lights. Lighting is a great & easy way to add ambiance at a party. These are quirky and sure to set the mood. 3. Kiss confetti. Confetti’s always good to have on hand at parties. It’s perfect for sprucing up the food table and works as a great photo prop. You can find versions of this kiss confetti at Party City. But if you’re particular about color, it also wouldn’t be too hard to DIY. Get some different shades of red, pink and orange tissue paper, fold them over each other, and cut out a lips shape. 5. Heart balloons. You can either blow up some latex heart balloons and scatter them around the room or fill them with helium and have them float on the ceiling. 6. Pink napkins. For simple snacks, napkins work great as an alternative to plates. 7. A chick flick. It is Valentine’s Day, after all. 9. Strawberries. A simple and sweet dessert that pairs perfectly with hot chocolate. 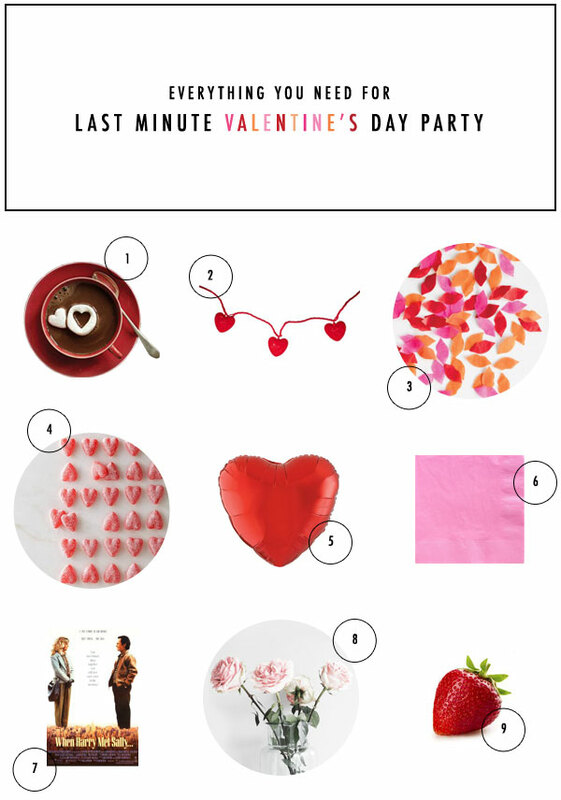 PS – Planning a last minute birthday party? Here‘s everything you’ll need. Oh I love these. Thanks for sharing. love when harry met sally – that and some hot chocolate would make a perfect valentines just about any time! So glad When Harry Met Sally is on this list. That movie never ages–well the clothing does, but the story is still so great. I hope everyone had a wonderful Valentine’s Day! I don’t have any special someone in my life at the moment so I spent the day with a friend, but we had fun anyway!